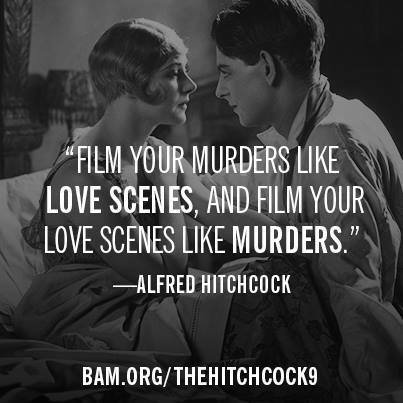 Whether or not Alfred Hitchcock was satisfied with “Blackmail,” his final film of the 1920s, there’s no denying the impact it had at the time. “Blackmail” has earned its place in cinema history in many ways. It’s the first British sound film, making inventive use of sound; it’s also Hitchcock’s first thriller since “The Lodger,” which I wrote about here. As we saw in the brief camera test here, Hitch’s star, Anny Ondra, had a heavy accent. Since she was playing a Brit, Hitch got around the problem by having another actress, Joan Barry, stand offstage and read the script while Ondra lip-synced on camera. One of the officers meets his girlfriend, Alice, to go out for the evening, although she is annoyed that he kept her waiting. In a crowded restaurant, Alice spots another man she knows. She and the officer, Frank, quarrel, and Frank storms out, leaving Alice to meet the other man, an artist. The artist talks Alice into coming up to his studio, and there he tries to seduce her by getting her to pose for him in costume. When he kisses her, she says she has to leave, but he’s hidden her own clothes. She asks him to give them back, but instead he tries to kiss her again. She turns away, and he attacks her, pushing her onto a bed behind a curtain. As she screams, we see her hand groping for a weapon – a knife. The screams stop, and his lifeless hand falls out from behind the curtain. Alice steps out of the curtain, knife in hand. She defaces one of the paintings she had praised only minutes before, then changes her clothes and leaves. Dazed, Alice wanders the city through the night, oblivious to the crowds but horrified when she imagines a neon sign with a cocktail shaker on it having a hand with a knife in it instead. Finally, she gets home, where she helps her parents run a small shop. Meanwhile, the neighborhood is abuzz with news of the murder. A woman hangs around the shop, talking on and on about how she could never kill someone with a knife until all Alice hears is the word “knife” over and over. On the crime scene, Frank finds one of Alice’s gloves and realizes what’s happened. He goes to the shop and tries to talk to her, but just then an unsavory character named Tracy enters the shop. He pulls them aside and says that he saw her at the murder scene. In not so many words, he starts demanding money to keep quiet. But Frank receives a phone call saying that the artist’s landlady has identified a possible suspect named Tracy. Frank sees his opportunity – he’s going to pin the murder on Tracy. Alice is horrified, and Tracy tries to talk his way out of it, but when more officers arrive, Tracy jumps out a window. "Look! A fabulous relic of the ancient world!" This leads to the famous sequence in which Tracy takes refuge in the British Museum with the cops hot on his trail. 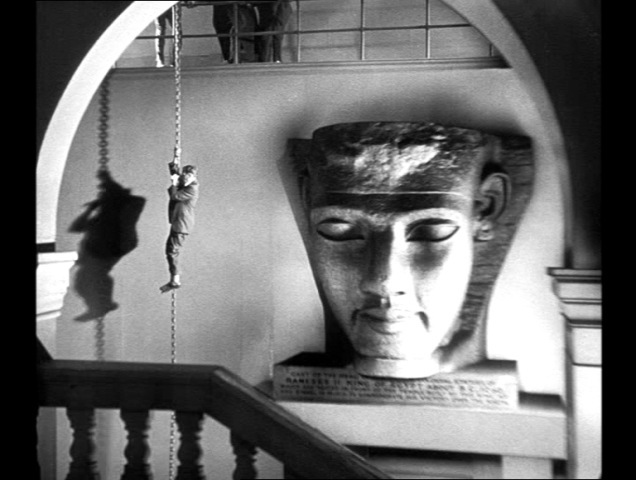 They weave through halls crowded with antiquities, until Tracy ends up cornered on the museum’s dome. With nowhere to run, he tries to talk his way out, but instead falls to his death. While all this goes on, though, Alice decides to turn herself in. 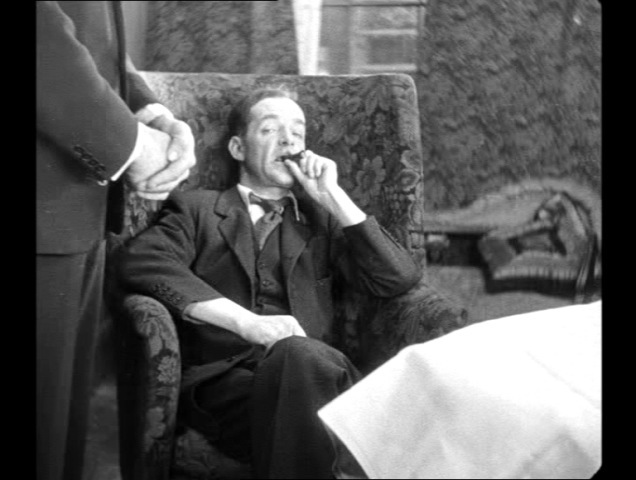 She arrives at Scotland Yard and is shown into an inspector’s office, where Frank is discussing the case with his boss. When the inspector gets a call, Frank is asked to take Alice’s statement. Frank leads her away, explaining what happened. Alice realizes that she won’t have to go to prison after all, but on her way out she sees some of the artist’s paintings being carried inside as evidence. The haunted look on her face speaks volumes. Along with the innovations in sound, like the knife-y conversation in the shop, the camera work in “Blackmail” is terrific. 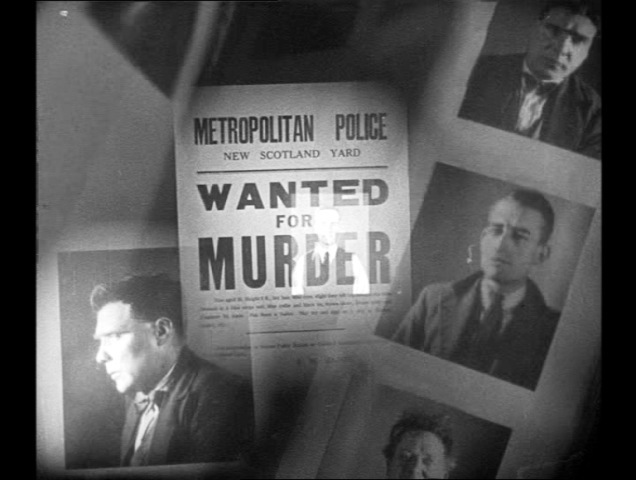 There are more panning shots, shots where the camera had to have been mounted on a moving vehicle, and a powerful montage of criminals as the landlady reviews mugbooks, where wanted posters and mugshots fade in and out as the pages turns. 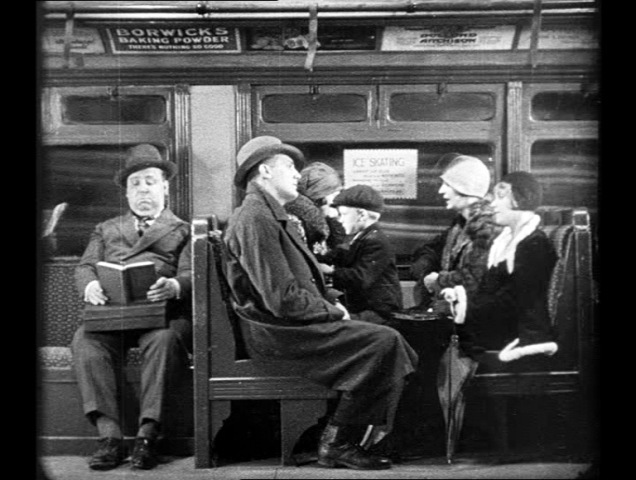 Hitchcock had made six pictures since “The Lodger,” his last thriller. 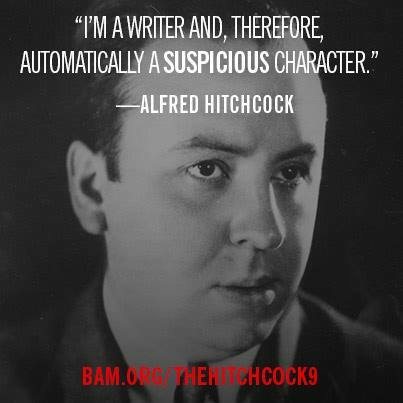 This was the genre that would boost him to international fame as “The Master of Suspense,” and it’s worth considering whether he chose this picture and subject matter knowing that he was at a turning point with the start of the sound era. 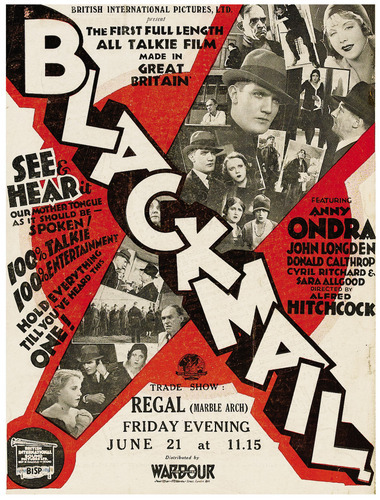 He was already the top director in England; he certainly must have wanted to make a splash with his first sound film, and “Blackmail” did just that. 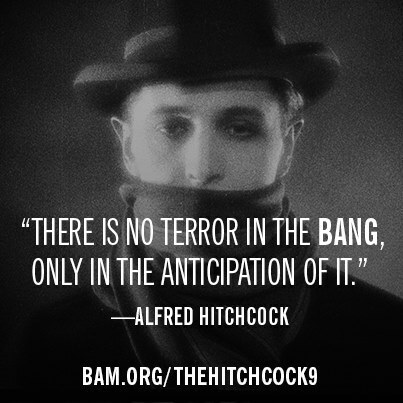 Although Hitch made quite a few movies in other genres and styles in the 1930s and 40s, he would always come back to crime, action and suspense. Anny Ondra, meanwhile, retired from screen acting after only a couple more films, a victim of the sound era and her own accent. He’s flirting shamelessly with Anny Ondra, and mugging for the camera while he’s at it, something he claimed to do to break actresses of their stage habits – although he’s clearly enjoying himself. After all, he hardly needed to be on camera with Ondra. The question, “Have you been a bad woman?” is one he’s credited with asking actresses many times during screen tests and auditions – it’s intended to provoke a response, whether it’s embarrassment or something else. Ondra, born in what’s now Poland, had a heavy accent, and even remarks on it in this test, and while Hitch doesn’t seem to care about it one way or another, she did not speak in “Blackmail.” Rather, she lip-synched on camera while Joan Barry stood to the side, saying her lines with a more acceptable accent. One more note tonight: To the right, there’s a box from which you can download my Hitchcock film schedule. That will remain there for anyone who wants to see it – so tell your friends!